Bihar Assembly today witnessed vociferous protest by NDA members demanding CBI probe into the paper leak scam in clerical grade examination of Bihar State Service Commission. PATNA: Bihar Assembly today witnessed vociferous protest by NDA members demanding CBI probe into the paper leak scam in clerical grade examination of Bihar State Service Commission (BSSC). They were also demanding the sacking of ministers reported to have sent recommendation to the BSSC Chairman in favour of their candidates. As the House sat for the day, Leader of Opposition Prem Kumar demanded suspension of the Question Hour to take up the urgent matter of the paper leak in BSSC exam. With the Speaker refusing to accept the plea citing that it was not in accordance with rules and it was not the right time for raising it, BJP and its NDA allies trooped into the Well and demanded a CBI probe and the sacking of the ministers. The Question Hour continued despite slogan shouting by the opposition members. NDA members whose names were called out for raising questions did not do so and remained in the Well. 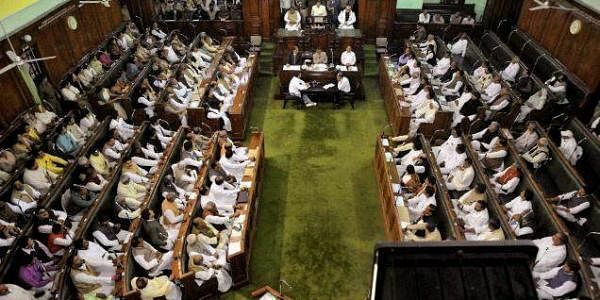 The opposition protest intensified subsequently and before the House was adjourned till 2 PM, some members upturned Assembly reporters' table forcing the staff to vacate their seat and also flew order papers in the air. The protest gained momentum when Chief Minister Nitish Kumar arrived in the House.